4 How does Acute Inflammation Help? Inflammation is the response of tissue to injury and is a series of processes initiated to limit damage to tissue. Acute inflammation is an innate, immediate and stereotyped response that occurs in the short term following tissue injury. This article shall consider the potential causes and signs of acute inflammation, the tissue changes that occur, immune cells involved and why it is necessary, as well as clinical conditions in which this process occurs. Acute inflammation can occur in response to a variety of situations where tissue damage occurs. Common causes include infections, hypersensitivity reactions, physical or chemical agents and tissue necrosis. Fig 1 – Image of a toe with acute inflammation. In the first few seconds following injury there is a transient vasoconstriction of arterioles. Following this vasodilation of arterioles and capillaries occurs. This results in an increased blood flow to the tissue – causing the signs of rubor and calor. There is also increased permeability of blood vessels, which results in an exudate (protein rich fluid) forming within tissues. In addition to this the circulation is slowed. These two changes lead to the sign of tumor. This results in an increased concentration of red blood cells within circulation, due to exudation of fluid, which leads to stasis of circulation in the area. This is mainly mediated by release of histamine from mast cells, basophils and platelets. Exudation of fluid occurs due to Starling’s Law. Vasodilation of arterioles leads to an increase in hydrostatic pressure, which leads to increased fluid movement out of vessels. In addition to this the increased permeability of vessels leads to protein moving to the interstitium, leading to an increase in colloid osmotic pressure, also increasing fluid movement out of vessels. This increase in tissue fluid also leads to increased lymphatic drainage, which can help to remove damaging substances. This fluid allows plasma proteins, such as fibrin to be delivered directly to the site of injury. The main immune cells involved in acute inflammation are neutrophils. 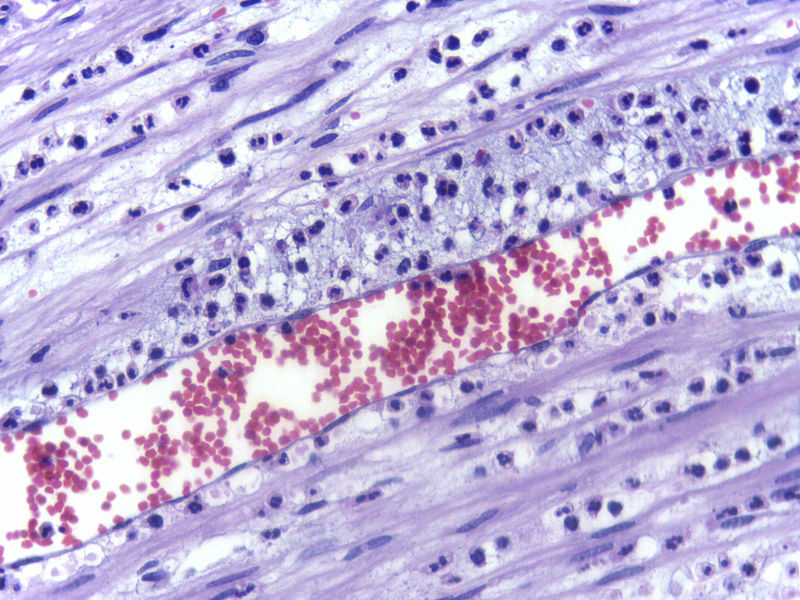 The stasis of circulation allows neutrophils to line up along the endothelium near the site of injury, known as margination. Next, they roll along the endothelium, sticking intermittently. Following rolling, they stick more avidly to the endothelium, which is known as adhesion. Finally, the neutrophils emigrate through the blood vessel walls. Neutrophils are able to leave blood vessels through relaxation of inter-endothelial cell junctions and digestion of the vascular basement membrane. Neutrophils move to areas of damage via chemotaxis. This is often following a concentration gradient of chemotaxins, which include C5a, LTB4 and bacterial peptides. Neutrophils are necessary as they are able to phagocytose pathogens and cellular debris to remove them, which is facilitated by opsonins. Further detail on the process of phagocytosis can be found here. Fig 3 – Electron micrograph showing margination of neutrophils in acute inflammation. How does Acute Inflammation Help? Acute inflammation can be the result of infection, as is the case in an abscess. An abscess is a painful collection of pus within tissue, that is often due to a bacterial infection. When this occurs in the liver it results in right upper quadrant pain, hepatomegaly, fever, night sweats, nausea and vomiting, weight loss and jaundice. Blood tests will often show a raised white cell count, abnormal LFTs and a positive blood culture. In addition to this the abscess can be identified using ultrasound or a CT scan. Treatment involves antibiotics, supportive measures such as fluids and pain relief and drainage of the abscess. Drainage is usually guided by ultrasound or CT and can be either aspirated or drained via a catheter depending on the size of the abscess. If the abscess ruptures open surgery may be necessary. Complications of liver abscesses include sepsis, rupture of the abscess, leading to peritonitis and secondary infection leading to further abscesses. 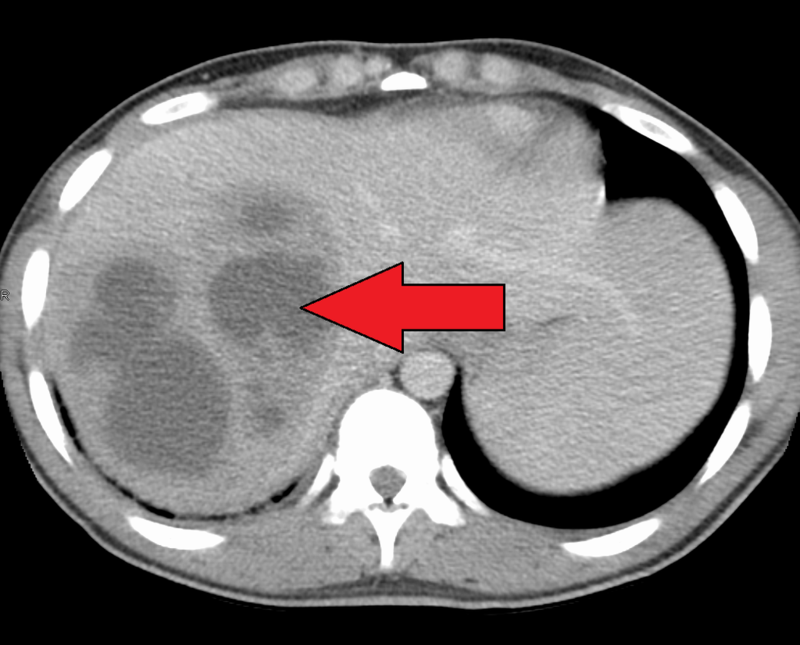 Fig 4 – CT scan showing a large liver abscess. The red arrow is pointing to the abscess.